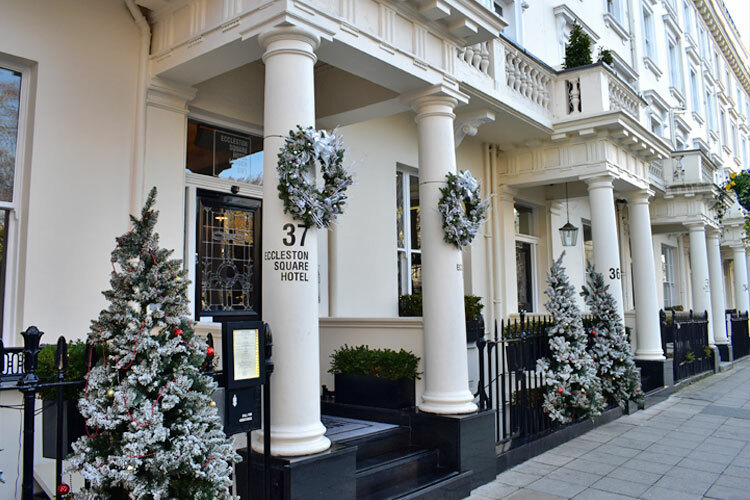 Tucked away just off the bustling streets of London and a short walk from London Victoria is Eccleston Square Hotel – A boutique hotel in a 19th Century Grade II listed building. Located two doors down from where Winston Churchill used to live, on a quiet street surrounded by a private garden you instantly feel the calm, homely atmosphere and forget that you are just meters away from the action of central London. Eccleston Square hotel boasts 39 bedrooms broken into four different categories: City Queen, City King, Signature King and a Balcony Room. Each room is teched out with the coolest of gadgets – Our room, the Signature King, had Sky Q, a 46 inch 3D TV, in-room iPad, smart-glass showers, hidden TV inside of the bathroom mirror and a touchpad in the wall to close our curtains and control the lights. As a whole, the room encapsulated the same theme as the hotel – modern, classy and very homely. The colour scheme of grey, white and black flooded the room with a large king size bed as the centerpiece. It was done with great taste and with the clever lighting in the room it felt bright, airy but still kept the moody, luxurious feel. The bed was super comfortable, an Instagram moment where you fall back and sink into the duvet. And the best bit is that it’s electronically adjustable, meaning you can adjust your positioning for your exact comfort, then you can turn on the vibrating function for a massage in bed at a touch of a button! The bathroom is beautiful with a gorgeous marble interior. It doesn’t come with a bath, but the waterfall shower was excellent. The smart glass was a nice touch making the room feel more open whilst the L’Occitane products were a great addition. There was a TV in the mirror just in case you wanted to listen to some music or hear the news. If there is one thing we recommend you do during your stay, that is breakfast in bed! There is a great offering from the healthy options: Organic oat porridge with seasonal fruit, poached eggs to the more indulgent choices: Classic full English, Cinnamon French toast and pancakes – In our eyes if you are treating yourself to a stay at this hotel you have to treat yourself to their full English. You won’t regret it, let’s just say it’s your day off. You can of course enjoy a fresh continental buffet breakfast as well as their la carte dishes in their restaurant located at the front of the hotel. Eccleston Square is a hotel that combines all you could want in a city break. It is classy, luxurious yet homely, warm and welcoming. The staff were extremely pleasant and happy to help whenever we called and the hotel is a short walk from London Victoria making it an ideal location. Whatever your reasons for staying in London, whether that be work or pleasure, the Eccleston Square Hotel London is sure to make a memorable stay.